Simon Says Stamp Cherished Release! I am so excited about Simon Says Stamp’s Cherished release. So many gorgeous new stamp sets, stencils, dies and sequins. 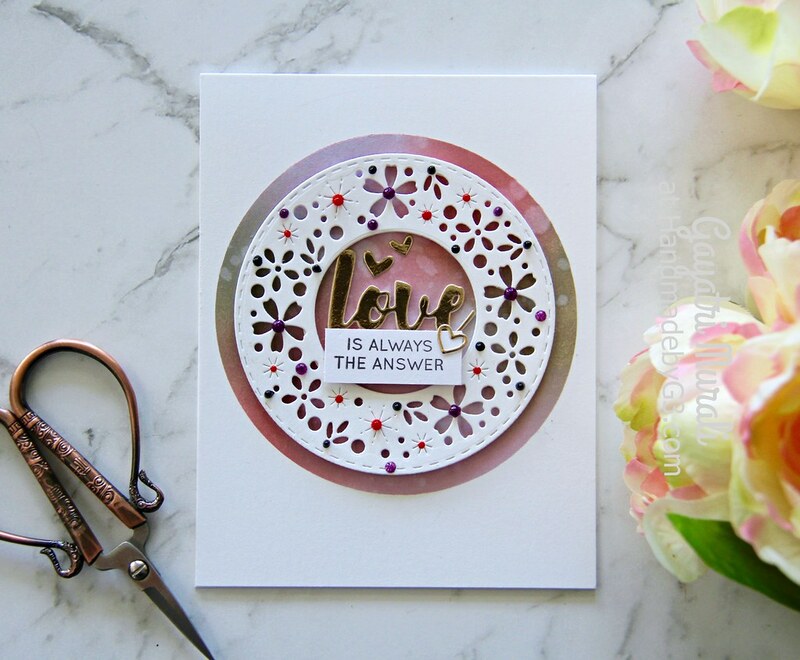 I am so lucky to receive the new Floral Sparkle Wreath die. Thank you so much Heidi for your generosity. Here is the picture of the die. Love love the delicate wreath. So pretty. I decided to make a wreath using the die to make my card. I die cut a white panel using the Floral Sparkle Wreath die. Then I used two stitched circle die to die cut into a circular wreath. To highlight the die cut wreath, I die cut a larger circle die using masking paper and used the negative panel to mask the card front. I then blended distress inks Victorian Velvet, Milled Lavender and Pumice Stone. I spattered some clean clear water to add texture to the sponged area. I removed the mask and adhered the circle wreath die cut using foam adhesive in the middle of the masked circle. The sentiment is made of die cut and stamped strip. The die cut sentiment is from an older Simon die called I Love You. 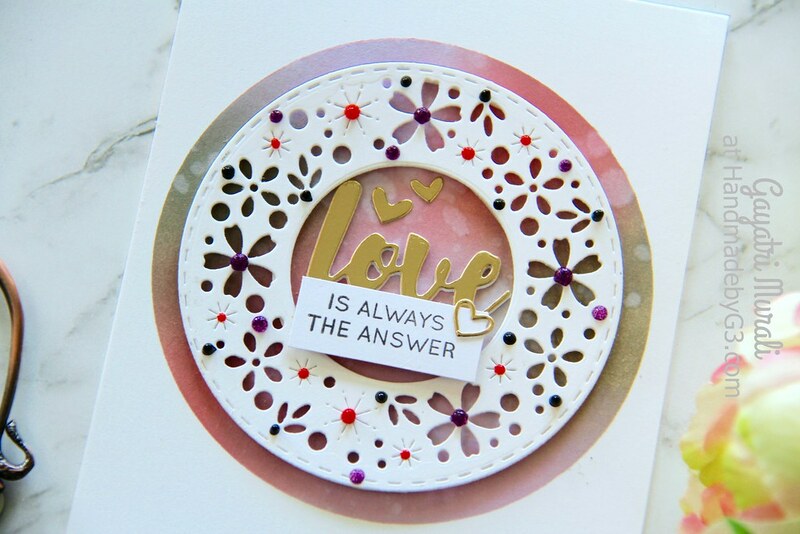 I only used the “love” die to die cut twice using white cardstock and once using gold foil cardstock. I stacked and glued them with the gold die cut on top. I adhered this to the centre of the wreath on the card front. The stamped sentiment is from Kristina’s Love stamp set simply stamped on a strip of white cardstock and adhered below the die cut sentiment using foam adhesives. I also die cut some heart shapes using Simon Says Stamp dies and adhered as shown. To embellish the wreath, I used Nuvo Crystal drops. All the new products from Cherished Release is available at Simon Says Stamp Store. Thanks for stopping by my blog. Happy Shopping!